beautifully that your friends won’t even know it exists…unless you want them to. Listen to audio all over the home through unseen speakers… and play different tracks from different CDs, MP3s or radio stations all at the same time, all routed from just one location… Brahms in the Bedroom; Kylie in the Kitchen and Louis Armstrong in the Living Room…the choice is yours. Picture perfect mood lighting, pre-set to enhance your interior and social requirements all controllable from a touch panel or even decorative inwall switches. 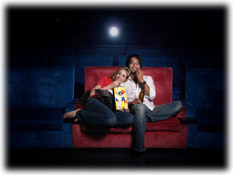 Experience the spectacle of the cinema in your very own, fully integrated home cinema. Projector and screen appear automatically from their discreet hiding place in the ceiling, the blinds close, the lights dim, the temperature is comfortable, the DVD is selected and everything is ready for action – all from just one system command on your portable touch screen. Don’t forget the popcorn and drinks. Feel totally secure. Enable the visuals from your CCTV cameras to be accessed on your touch screen or any TV in the home. See who is at the front door from any room in the house, or even from your cellphone or laptop at work! Communicate: Answer the front door, page the kids through the speakers, mute the music or put a caller on hold using any fixed line or cordless phones in the home. Realize these dreams today using robust, proven technology. We work with you to design, install, integrate and maintain the electronic systems in your home. 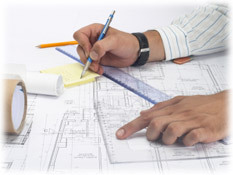 The process begins when the client, architect, developer or interior designer expresses the desire to incorporate technology into a building project. Electronic Architects then creates a design that encompasses the technology customised to suite specific client demands & budget. Due to the increased demand for this technology to enhance lifestyles, there are burgeoning requests for retro-fitting into existing homes but more importantly there is the requirement to plan for future electronic needs by installing a foundational wiring framework in the building. By including such wiring the house can be fitted out with the required products whenever the demand is there. Electronic Architects work with design professionals to help homeowners get the most from their living environment. Electronic Architects work with other specialists such as architects, builders and interior designers when planning home automation systems. optimally with all the other relevant parts of the system & process. Audio-visual, Home cinema ,Hi-end music, Acoustics, Multi-room distributed audio-video, Integrated telecommunications, Home networking, Access control, Integrated Security, Airconditioning , Underfloor heating, Pool motors, Irrigation, Lighting systems, Pond and filter systems and much, much more! Through involving Electronic Architects in your design & build process, you are ensuring the delivery of high levels of skill and expertise enabling you to get the most out of your home. Automated systems incorporated within the home enable home-owners to enhance their lifestyle on a practical level. We specialise in custom design, supply and installation of audio and visual, home automation and integrated electronic systems for the home and professional market place. We also cater for the integration of lighting, security and various other electrical and electronic systems in the home providing home automation, surround sound and whole house audio/ video distribution. We are authorized dealers for most known brands of audio/ visual and home automation equipment: Speakers, big and small screen TVs, Plasma displays, LCD TVs, projectors, screens, amplifiers, CD players, music, video and media centre servers, home theatre components, etc. AMX, Artcoustic, Adcom, Bowers & Wilkins, Bang & Olufsen, Boston Acoustics, Crestron, Clipsal Cbus, Clark Synthesis, Denon, Dynaudio, Elan Home Systems, Energy, Fujitsu, Gira EIB, Hitachi, Infocus, Jamo, JVC, KEF, Krell, Kiss, LG, Liberty wire and cable, Loewe, Marantz, Microsoft, NAD, NEC, Niles, Onkyo, Panasonic, Projection Design, Philips, Pioneer, Polk Audio, Optoma, Rotel, Russound, Samsung, Sonus Faber, Sim2, Sony, Stewart Filmscreen, Toshiba, Universal Remote Controls, Vantage, Yamaha. It’s all about choices! Once you’ve lived with it you won’t want to live without it!